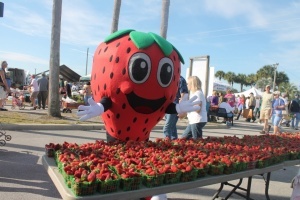 Volusia County Farm Bureau and area partners celebrate Food Check-Out Week with Strawberry Celebration Day each year at the Volusia County Fairgrounds in Deland. The event takes place in February and raises awareness on the importance of eating healthy foods on a stretched budget. It includes educational demonstrations at the farmer’s market and special appearances by “Jammer,” Florida’s strawberry mascot. 3090 E. New York Ave.